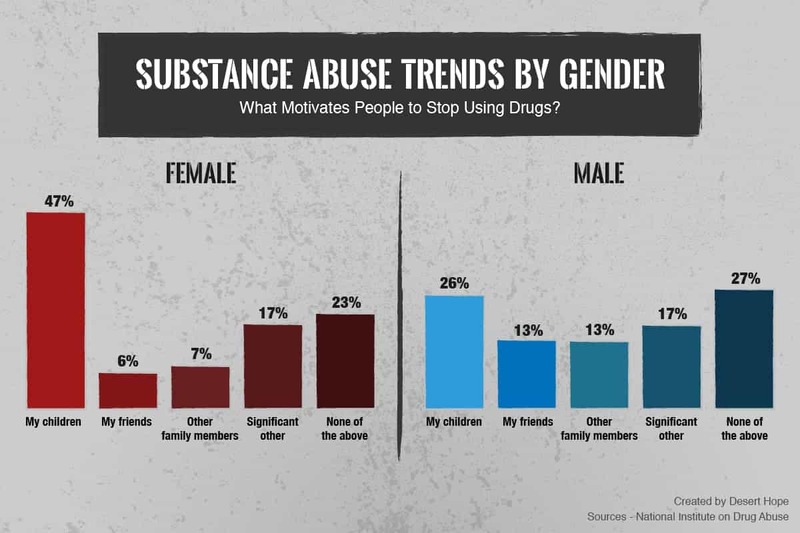 While addiction is an equal-opportunity disease, there are clear divides between gender that have been analyzed and documented for decades. 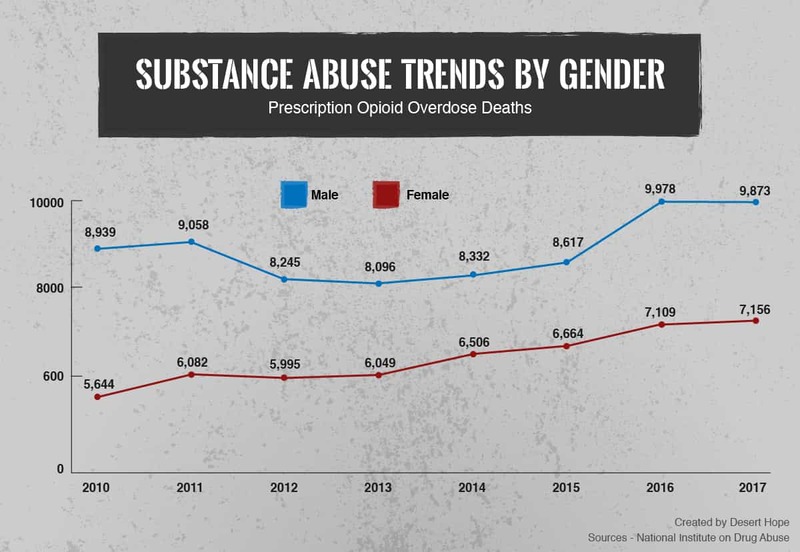 It’s commonly known that men are more likely to experience addiction than women, but as addiction rates rise, it’s becoming increasingly common for women to seek treatment as well. 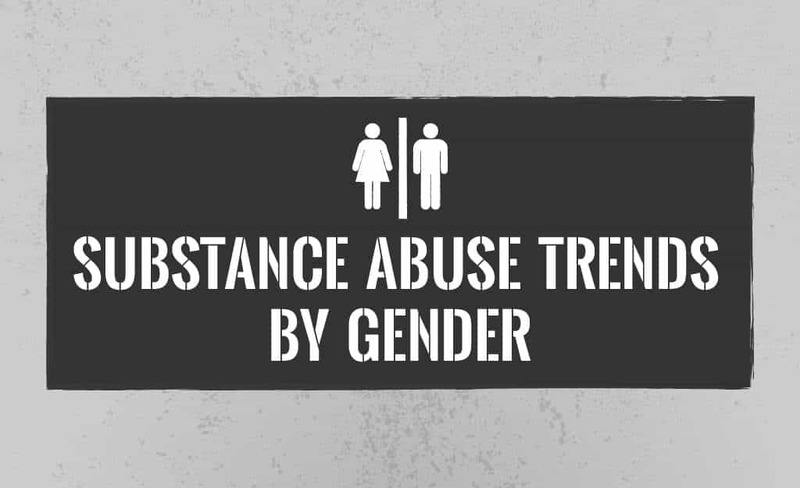 This campaign used a combination of survey results and data to look at the gender divide in addiction in real time. We surveyed 1,500 people who have abused drugs in the past and examined data from the CDC and the National Center for Health Statistics going back 2 decades. We’ve compiled the most compelling statistics below. 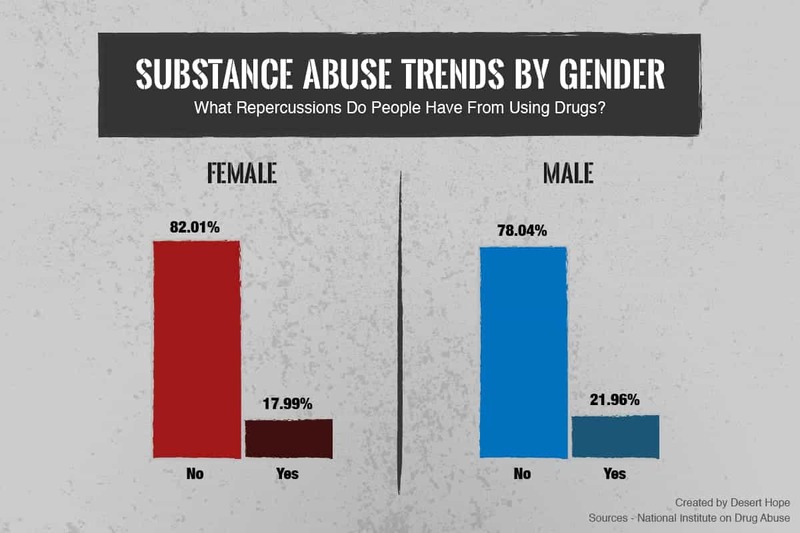 According to survey results, women are more likely to abuse marijuana and prescription drugs than men, and they were almost equally likely to abuse ecstasy as men were. 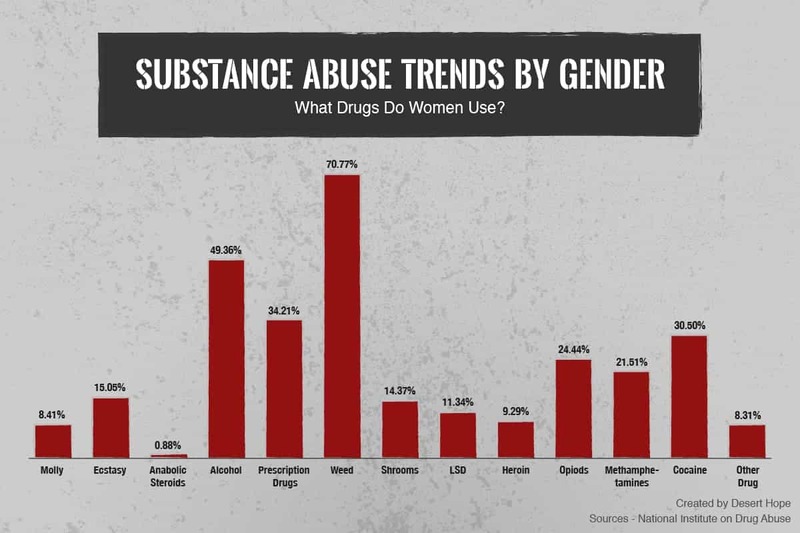 The most common drug for women to have abused was marijuana, and they were least likely to have abused anabolic steroids. Based on survey responses, men are more likely to abuse the vast majority of illegal drugs – molly, anabolic steroids, alcohol, shrooms, LSD, heroin, methamphetamines, ecstasy, and opioids. And while the most common drug they used is marijuana, over half of the men we surveyed also admitted to abusing alcohol. When asked what their biggest motivation to stop using drugs, respondents overwhelming named their children. The most significant demographic to respond that way, however, were women. Men were more likely to say that their children, friends, family, and significant others were not factors that encouraged them to pursue sobriety. Most respondents stated that they do have permanent health damage as a result of their substance abuse. 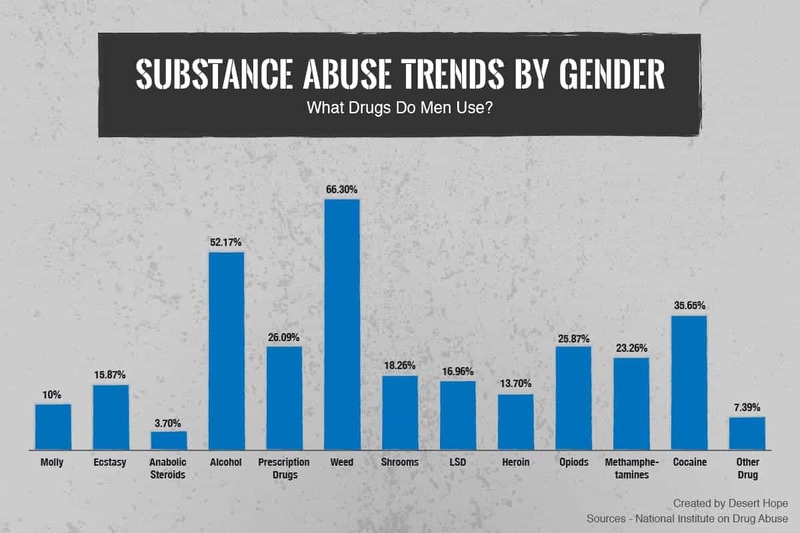 According to our survey, men are most likely to have permanent health damage from substance abuse, but still, only 1 in 5 male respondents said that they have ongoing health concerns directly related to drug use. Deaths related to an overdose from any type of opioid totaled 42,249 in 2016. Over the course of 2017, that number increased to 47,600, a 13% increase in 12 months. Over twice as many men died than women as a result of opioid overdoses. Overall, 32,337 men died due to opioid overdoses, while 15,263 women lost their lives to opioids. 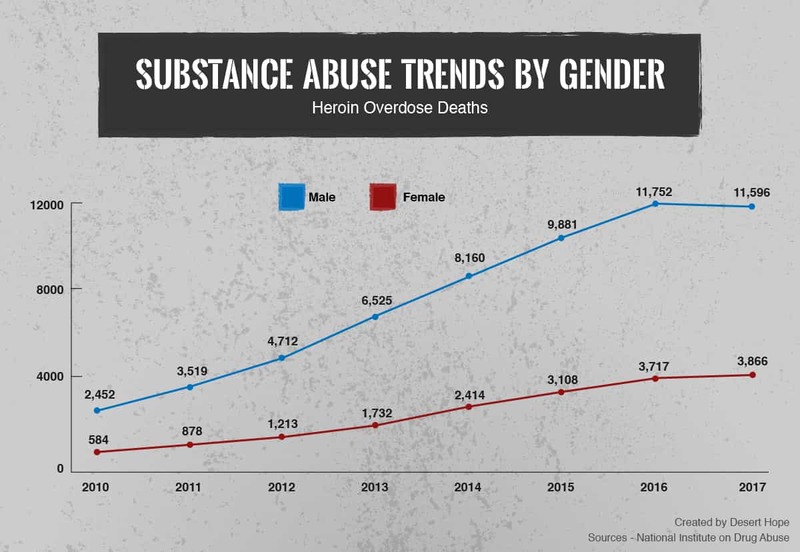 In the case of heroin, men were over 3 times as likely as women to die from an overdose. Fewer than 4,000 women lost their lives as a result of heroin abuse, while over 11,000 men died due to their heroin abuse. However, for the first time in recent years, the number of annual heroin overdoses in men decreased, which is a promising sign. Prescription opioid overdose accounted for over 30% of opioid overdose deaths in 2017. 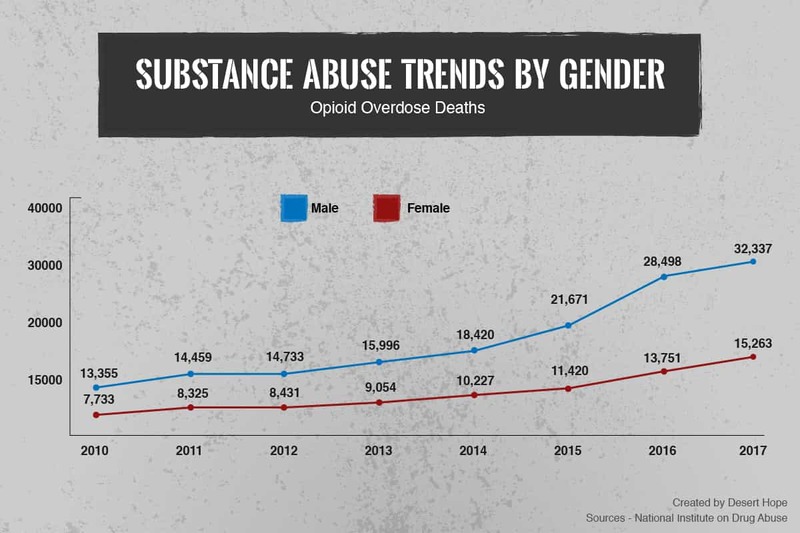 This type of overdose showed the smallest gap between men and women. Men were only 16% more likely to overdose on prescription opioids than women. Addiction is an ongoing problem in the United States today, and the rates of overdose and substance abuse are rising every year. As this disease touches more lives, it’s important to understand how the risk affects those closest to you, including signs of addiction you can watch for. If you or your family need more information or support, visit our resource center or contact us.